The town of Currie was settled in 1888 and named for John H Currie, a director of the Cape Fear & Yadkin Valley Railroad. The community of Currie is a most progressive settlement of farmers and business men. Currie has, for the most part, Old Walker Storeremained unchanged; a place with farmlands, small homes and winding roads. Wildlife such as deer and bear can be spotted anytime of the day. The Bell House is one of the oldest homes in Currie, built in 1864 by descendents of Elizabeth Moore. Also still standing is a one room schoolhouse located on Hwy 210. 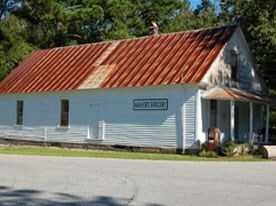 Currie is home of the historic Moores Creek National Battlefield. On the dawn of February 27, 1776, the Patriots overtook the Loyalists. The park offers a visitor’s center, a trail that leads across the bridges, exhibits, and picnic areas. A reenactment of the battle is held annually the last full weekend in February.